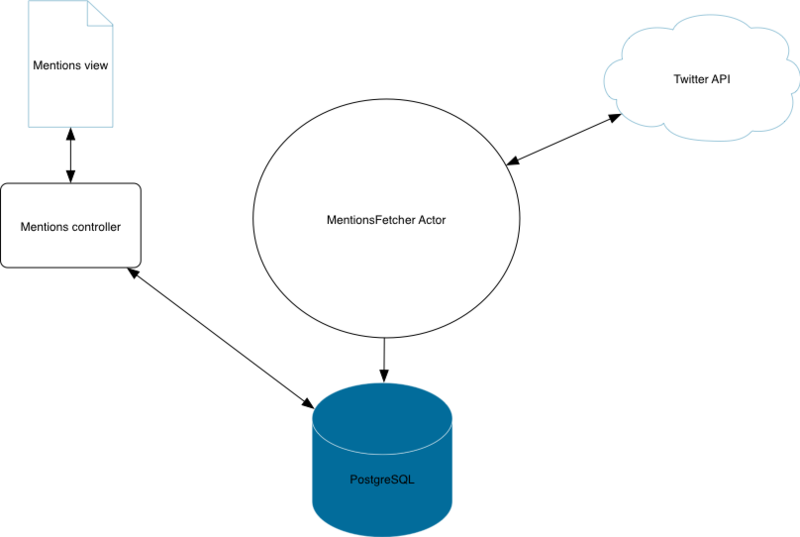 Reactive Database Access – Part 3 – Using jOOQ with Scala, Futures and Actors – Java, SQL and jOOQ. Et voilà! Full Java code is on GitHub https://github.com/smillies/reactive-db-access in the form of an Eclipse Maven project. Launch configurations for the Akka and non-Akka versions, plus JOOQ code-generation are included. Twitter access tokens you will of course have to get yourself. Instead of Postgres, I opted for an H2 in-memory DB, so you don’t need to install anything. I simplified the SQL a bit, using JOOQ’s onDuplicateKeyIgnore(). There were a few little mistakes in the post (like trying to insert users without filling the primary key field user_id). Comparing the Scala code in your post to my Java version, my impression is that Scala is a bit more elegant and concise, but also more cryptic. How do you model asynchronous transactions, though? having looked at some of the issues on Github, I am sure you have thought more deeply on this question than I ever will. The naive implementation that you sketch in issue 4435 is like what would have come off the top of my head as well. Anyway, if the database offers real asynchronous transactions, I think the library API should be neutral with respect to this, it would probably be a connection property or some such. And thinking of the typical case of a back end to your heavily used web app, where users generate many small transactions, it would in my opinion also take away most of the motivation for having asynchronicity in the application at all. After all, that always comes at a cost, and you don’t want to pay that twice. Thank you very much for sharing your thoughts. I do suspect that ACID and asynchronicity are two opposing concepts in the long run, and thus I agree with you, this will probably come at a cost. SQL Server and PostgreSQL certainly do in simple ways, but I’m not aware of a way to access these features through standard JDBC. One nice feature that is available in many databases is the ResultSet.HOLD_CURSORS_OVER_COMMIT flag (result set holdability). This isn’t the same as an asnychronous transaction though, by which I understand a transaction that can jump from one session / connection to another. However, while our industry seems to crave for this feature on a hype level, I doubt that anyone actually really wants it. Being able to send a transaction as an atomic unit to an Executor and to asynchronously handle the result might just be enough (for now). Looks like I missed this! Great implementation! As mentioned I am pretty much out of touch with Java lately so it’s good to see how things are done in Java-land on the reactive side of things. There is just one comment I would have, about Twitter4J: sure, it gives you an API, but it is a blocking API. Wrapping it in a CompletableFuture does not make it somehow magically truly asynchronous, it just makes it composable with other CompletableFutures and runs the operation on a different thread, but it still blocks that thread while the network I/O access is made. Play’s WS library uses Netty under the hood which is entirely asynchronous meaning that while Twitter answers, the thread is not locked and available to others (this asynchronous / non-blocking behaviour is ensured at the OS level, e.g. using the select() call for linux – https://www.win.tue.nl/~aeb/linux/lk/lk-12.html). This of course is also true for DB access, however there isn’t to my knowledge any stable async driver for postgres and friends (an async alternative implementation of JDBC if you will) so there isn’t much choice in that space. Anyhow it is good to see how this can be done in Java, I’ll reference this implementation when I’m asked for it! I think execute() should be fetchOne().value1()? You’re right, thank you very much. Fixed!